A photo of Simeon Nickerson is displayed at a Middleborough American Legion post. 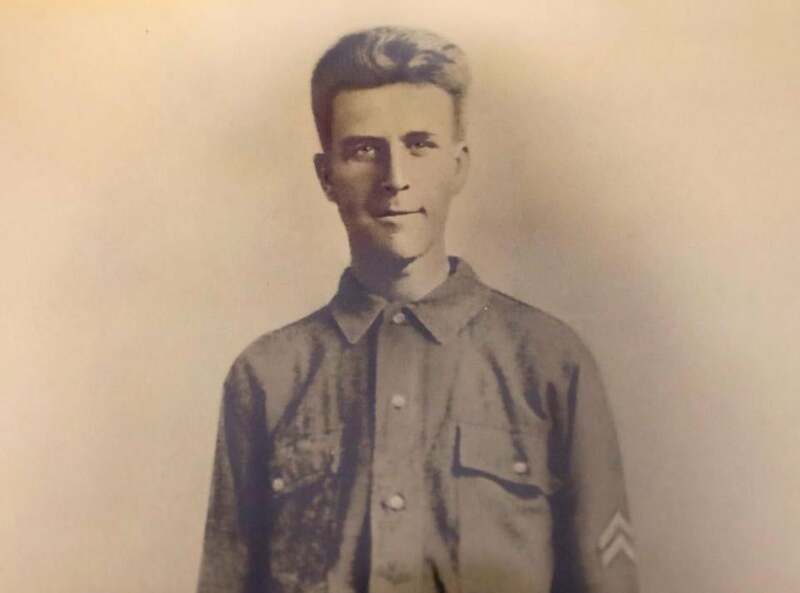 MIDDLEBOROUGH — Sergeant Simeon Nickerson, a shoe-factory worker from Middleborough, crouched in the woods 60 miles east of Paris as German bullets crackled all around Company D of the 101st Infantry Regiment. The day was July 23, 1918, and the company was pinned down in an Allied offensive during World War I, unable to detect the location of the enemy’s machine-gun nest. Nickerson, a 25-year-old orphan raised by a Civil War veteran, knew what to do. He volunteered with two soldiers from Boston to cross an open field and draw fire from the Germans, showing his casualty-depleted unit — many of them brothers, neighbors, and friends from Massachusetts — where to train their rifles. The mission was suicide, which Nickerson undoubtedly knew. Only a few dozen heartbeats after entering the field, Nickerson was decapitated by gunfire. He did not die in vain. The machine guns were located and silenced, and the company’s 150 surviving soldiers resumed their advance in a breakout offensive that helped end the long, ghastly war. The time capsule included instructions to open it on Nov. 11, 2018 — 100 years after the end of the war. Today, few people in Middleborough know about Nickerson’s heroism during the Second Battle of the Marne, the ultimate sacrifice of a young man without a wife or children. 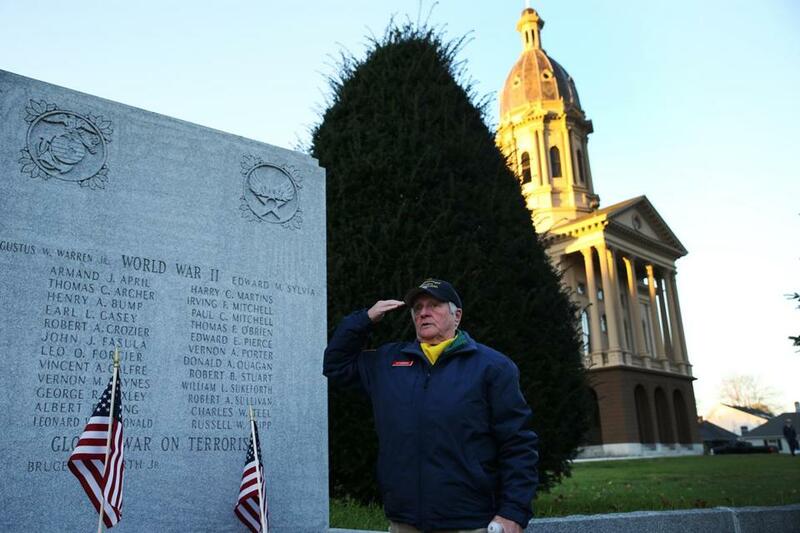 But on this Veterans Day, a century after the Armistice ended hostilities, a handful of soil from his French grave was sprinkled beneath the town’s war memorial by a local Air Force veteran who was inspired by his extraordinary bravery. Mary Standish, 71, of Middleborough, spread dirt from Simeon Nickerson's grave in France onto a memorial outside of Town Hall. 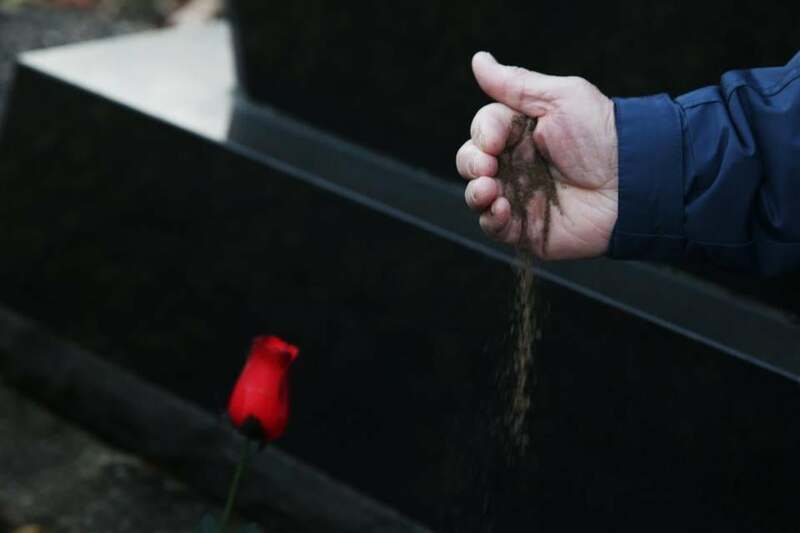 It’s a long-delayed homecoming of sorts, a brief but solemn ceremony to recognize a casualty of the “war to end all wars,” a man whose death has been obscured by the passing years and many wars that followed. In many ways, Nickerson’s story is emblematic of a simpler time when patriotism was largely uncomplicated, and friends joined friends in close-knit, hometown National Guard units that were later shipped to the front lines. 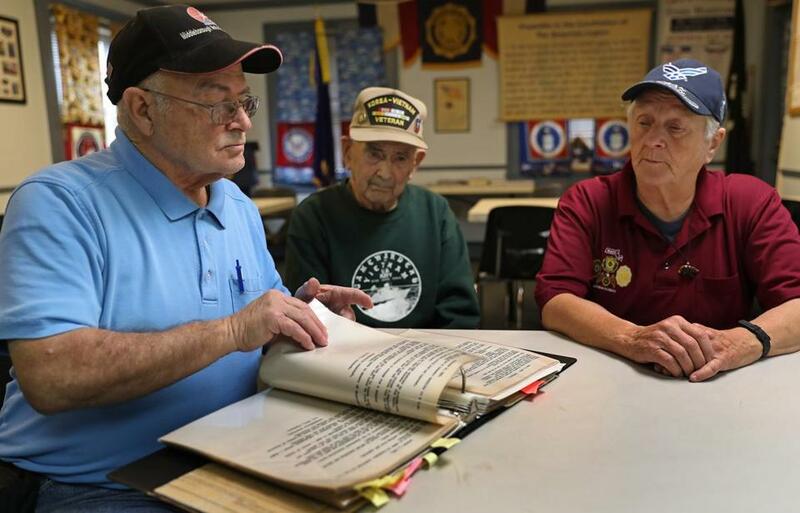 “I am sure that we all from Middleborough appreciate what the Commercial Club has done and is doing for our benefit,” Nickerson wrote from France to a local business group that mailed packages to soldiers. Born in Rochester, Mass., Nickerson had a brother but lost both of his parents by the time he was 6. He moved in with his grandfather, Hiram F. Nickerson, a Middleborough man who had fought for the Union Army. Nothing is known of Simeon Nickerson’s early years, but century-old photographs show a high school student outfitted with a dress shirt, tie, starched collar, and vest. Another, from his Army service, shows a slender man with a long, narrow face, his eyes fixed on the camera and a hint of a half-smile. He wears the loose-fitting uniform of a corporal. In June 1916, Nickerson enlisted in Company D as a member of the Massachusetts National Guard from Plymouth County and soon found himself guarding the Southwest border against Mexican revolutionary Pancho Villa. He wrote back of curious homes built of adobe brick, 15- to 25-mile marches, and losing 12 pounds from an already thin frame. His grandfathers and uncles had fought in the Civil War, and Nickerson took pride in their legacy. By the time Nickerson sailed for France in September 1917, his company had been merged with a National Guard unit from Boston to form the 101st Infantry Regiment, a 3,500-man piece of the 26th Yankee Division. “Irishmen from Boston were joined with the men of Plymouth. I’m sure it took some adjustment,” said Leonid Kondratiuk, a retired Army brigadier general and director of historical services for the Massachusetts National Guard. 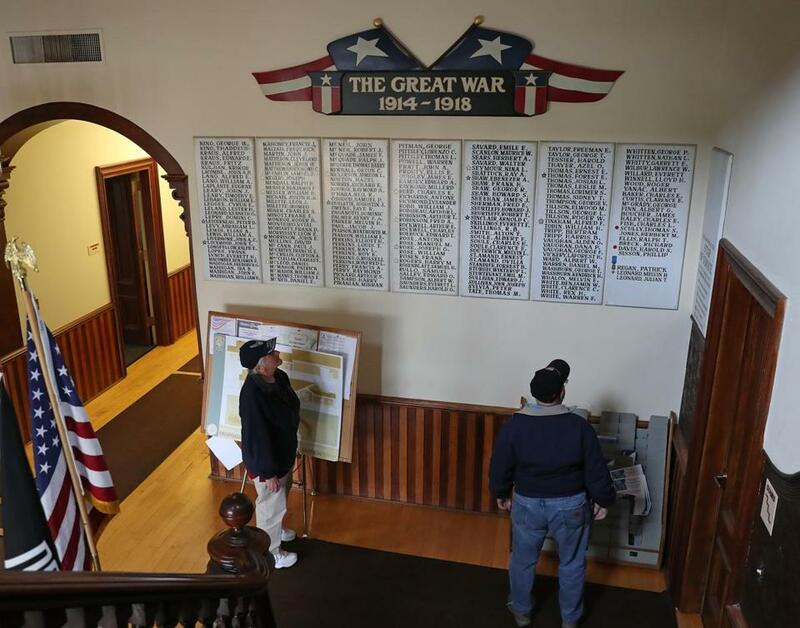 Inside Middleborough’s 145-year-old Town Hall, two large wooden plaques list the names of all 415 men who left a town of 8,000 people to serve in World War I. Like Nickerson and 14 others who died, many of them worked in busy shoe factories. Others came from poultry and dairy farms, and also from the cranberry bogs. In Middleborough town hall, Bob Lessard and Mary Standish looked over names of those who served their country in World War I. 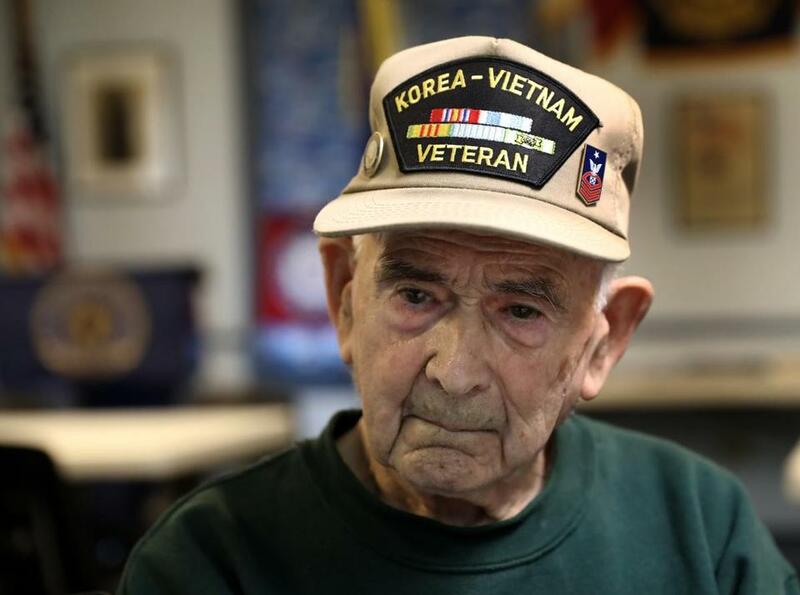 On a recent visit to Town Hall, Walter Campbell Jr., an 89-year-old Navy veteran of the Korean and Vietnam wars, pointed to Nickerson’s name and then to his father’s, another Middleborough man who fought in France with the 101st Infantry. Campbell’s father joined the National Guard for reasons that would have been familiar to many recruits of the day. “A friend told him that if they joined the Guard in Plymouth, they would give them all the free beer they could drink that weekend and a free steak dinner that Saturday night,” Campbell said with a chuckle. His father also told him how he shook Nickerson’s hand just before the sergeant ventured into the killing zone with Corporal Michael O’Connell of Jamaica Plain and Private Thomas Ryan of the South End of Boston, who also were cut down. It’s a story Campbell has never forgotten. The year after Nickerson was killed, the town’s newly created American Legion Post 64 was named in his honor. In 1927, a World War I veteran from the post visited Nickerson’s grave, spreading hometown soil below the cross at No. 9, Row 19, Section A in the Oise-Aines American Cemetery for 6,000 war dead. From left to right: Bob Lessard, Walter Campbell Jr., and Mary Standish. Ninety-one more years are believed to have passed before Nickerson received another visitor from Middleborough, this time from Air Force veteran Mary Standish, a member of Post 64 who wanted to honor its namesake. Before her trip this summer, Standish scooped up a bit of dirt from the town’s Veterans Memorial Park. And in a nod to 1927, she placed it on Nickerson’s grave. She also filled a small aspirin bottle with a few pinches of dark French earth to bring home. 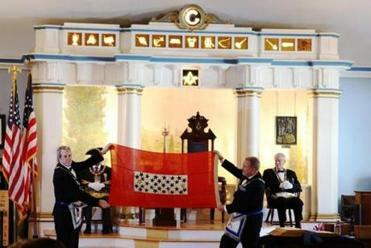 “I felt very honored to be able to do this,” Standish said. Mary Standish saluted at a memorial outside of Town Hall. The post’s commander, Air Force veteran Robert Lessard, is determined to rekindle awareness about Nickerson, who posthumously received the Distinguished Service Cross, the Army’s second-highest military award. The Globe’s war correspondent, Frank Sibley, wrote of their exploits as he covered the fighting with the Yankee Division, which sent 28,000 New Englanders to Europe, along with 14,000 horses and mules. 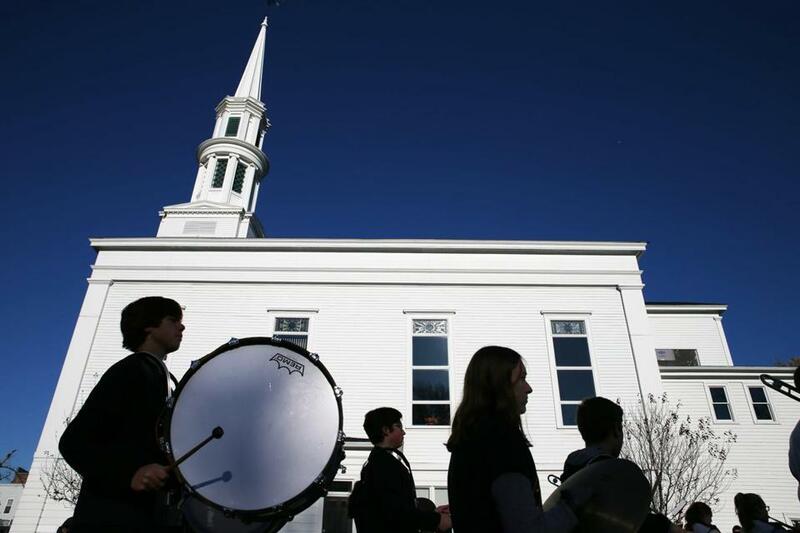 Members of a Middleborough marching band walked past the Central Congregational Church during the Veteran's Day Parade on Sunday. On Sunday, Middleborough honored Nickerson at Town Hall. Lessard spoke of his heroics. Campbell and six other veterans fired M1 rifles in salute. And Standish sprinkled dirt at the stone monument that honors Nickerson and others from Middleborough killed in war. For Silva, Nickerson’s great-great-niece, the sergeant’s long-ago sacrifice remains a deep source of pride. “I think his grandparents must have taught this to him, to be selfless like that,” Silva said. “I can’t even imagine being a young man and knowing I’m going to go out there and not come out alive.